UPDATE: These passes are gone! July is notorious for bad air quality along the Wasatch Front. 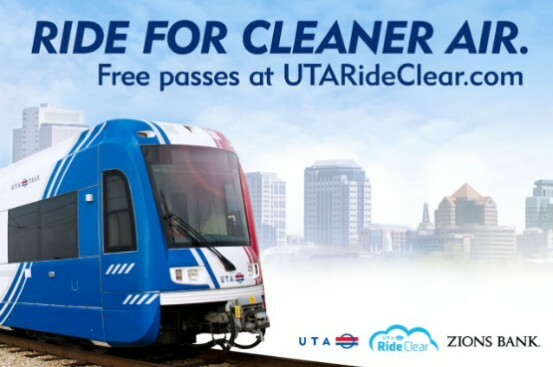 Do your part to keep it clean by riding UTA buses, TRAX, or FrontRunner during July. If that doesn’t fit in your budget, visit Ride Clear UTA to snag a FREE 7-day pass for UTA transportation to use in July. The pass is a $50 value. Zions Bank and UTA are sponsoring the promotion to give out 2500 free rides! Sign up HERE and your pass will be mailed out to you to use for any seven-day period in July. Limit two per household. THE PASSES WERE ALREADY GONE WHEN YOU SENT THE EMAIL. THE ORIGINAL POST WAS YESTERDAY ON FACEBOOK.